Poster from the 1980 Republican National Convention in Detroit, Michigan July 14-17 in which Ronald Reagan was named the party's nominee for President and George H. W. Bush for Vice President. The poster depicts the 16th President Abraham Lincoln and an elephant, the symbol of the Republican Party. This poster was designed by Russell Stevens Studios the same year. 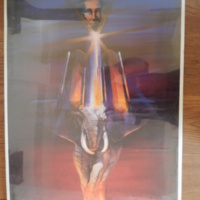 A promotional poster from the 1980 Republican National Convention depicted Abraham Lincoln and an elephant. “Republican National Convention Poster ,” UIS History Harvest, accessed April 19, 2019, http://uishistharv1.uis.edu/items/show/99.